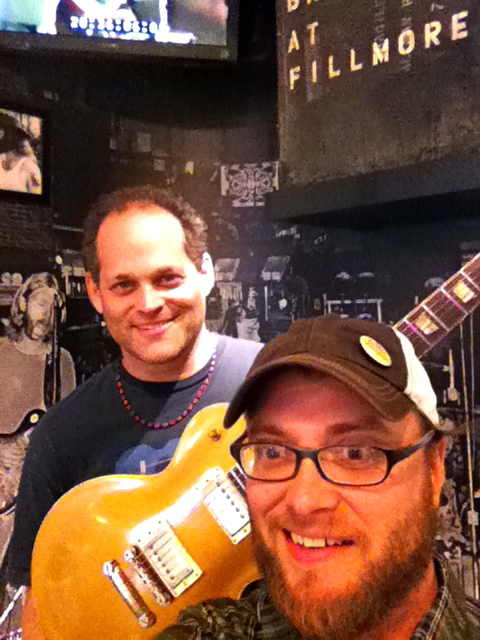 Duane Allman’s 1957 Les Paul and the Big House Museum. 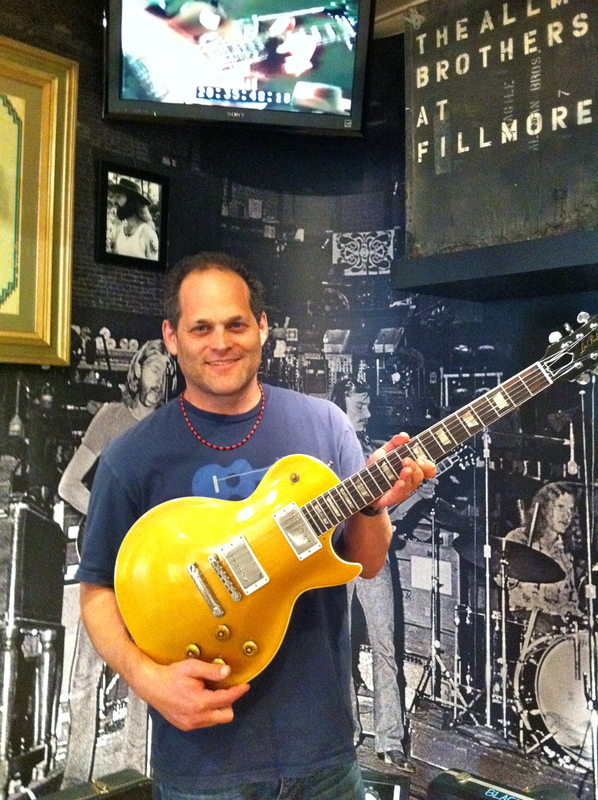 Originally published in Guitar World, January 2011, this story is a bit outdated in terms of how the goldtop is being used… As many readers know, the guitar has been played by many since this was written, including Warren Haynes and Derek Trucks – the latter played it at the Crossroads Guitar Festival 2013, reuniting it with Eric Clapton and Derek and the Dominos when EC joined the ABB for “Why Does Love Got to Be So Sad.” Scroll to the bottom of the page to see that. E.J. 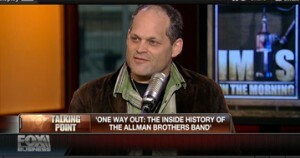 Devokaitis and the Big House Museum and Archives were tremendously helpful in my research for One Way Out: The Inside History of the Allman Brothers Band, helping give the book a tremendous amount of added depth. Thank you to E.J. and everyone involved in that great institution. Duane Allman’s long-lost 1957 Gibson Les Paul goldtop has been found and given a new lease on life courtesy of the Allman Brothers Band Museum at the Big House. Duane Allman played a gorgeous 1957 Les Paul goldtop for the first 18 months of his two and half years in the Allman Brothers Band. 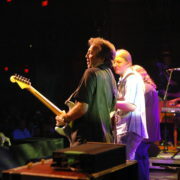 He played the goldtop on the band’s first two albums, which featured the original versions of “Whipping Post,” “In Memory of Elizabeth Reed,” “Midnight Rider,” “Revival” and other classics, and he played it on his numerous sessions with other artists, including Derek and the Dominos’ 1970 masterpiece, Layla and Other Assorted Love Songs. 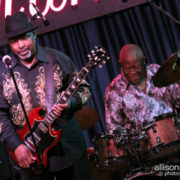 Then Allman swapped the guitar for a sunburst Paul, and this piece of rock and roll history disappeared into the ether. Now the goldtop is back where it belongs: in the spotlight. Today, Duane’s former guitar is on display at the Allman Brothers Band Museum at the Big House in Macon, Georgia. What’s more, it can be heard on a new recording, Guitar Magic, by the Skydog Woody Project, which also features the 1976 Gibson Thunderbird bass once owned by late ABB/Gov’t Mule bassist Allen Woody. The story of how Duane and the goldtop became separated is a classic tale of guitar lust. 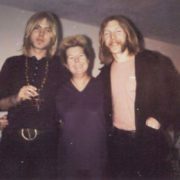 On September 16, 1970, the Allmans played a show in Duane and Gregg Allman’s hometown of Daytona, Florida. Duane, fresh off recording Layla with Eric Clapton and company, was, as usual, playing his ’57 goldtop. The opening band was a local group called the Stone Balloon, whose guitarist, Rick Stine, was playing a 1959 cherry sunburst Les Paul, which caught Duane’s eye. While making Layla he had fallen in love with Clapton’s cherry sunburst. Wanting one of his own, Duane offered to swap Les Pauls with Stine. When Stine balked, Allman upped the ante, throwing in $200 and one of his regular Marshall 50 heads. Stine agreed, but Duane had one caveat: he wanted the goldtop’s pickups for his new ’burst. The electronics were swapped, and the deal was done. 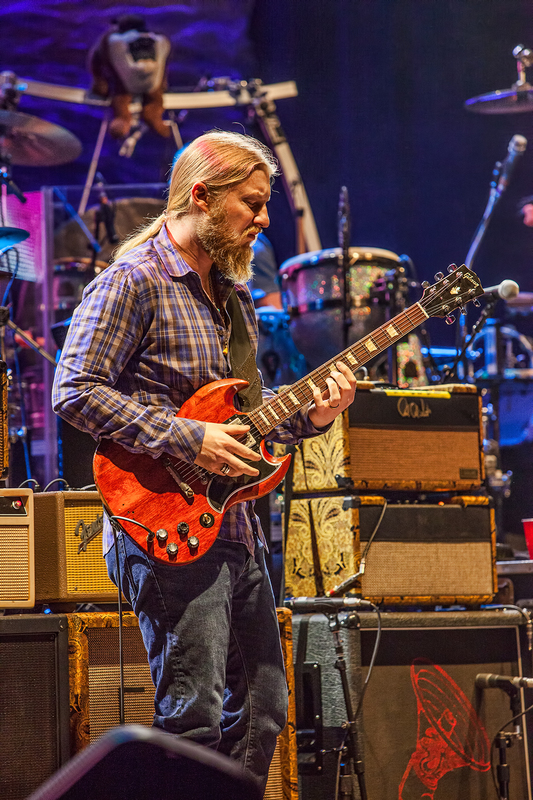 Exactly one week later, on September 23, Allman played his new guitar when the Allman Brothers Band performed at the Fillmore East in New York City, a fact born out by video footage from the show. He played his new cherry ’burst throughout the rest of his career, which ended far too soon when he was killed in a motorcycle crash on October 29, 1971. Meanwhile, Allman’s original goldtop drifted around Daytona, passing through the hands of three different owners, the last of which eventually sold it to a local guitar store. In 1977, the shop sold it to Gainesville guitarist Scot LaMar. He’d heard from his friend Billy Bowers that Duane’s Les Paul was for sale in Daytona, and he rushed to the store to purchase it. 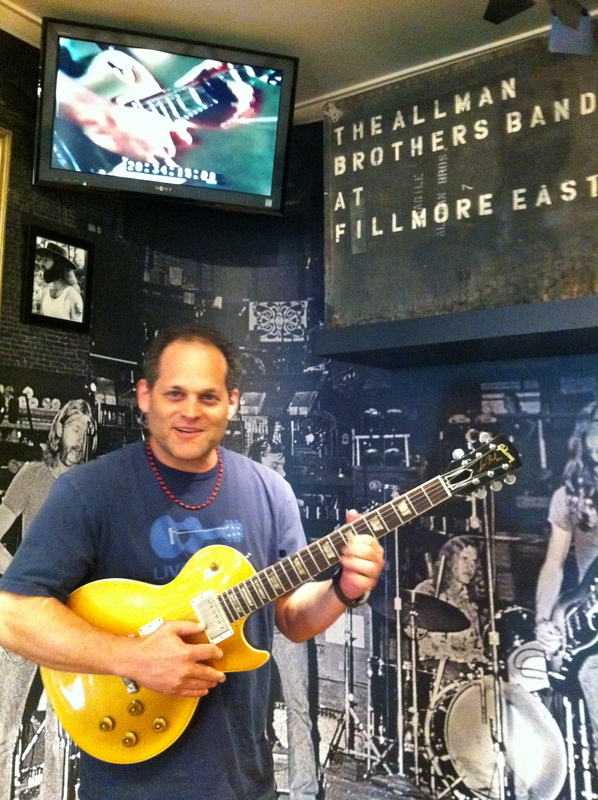 He paid $475, a fair price for a vintage Les Paul in 1977. The goldtop had some damage, including a bite mark on the headstock from a previous owner’s dog. LaMar had two respected luthiers refinish the guitar, but he was dissatisfied with the results and eventually had the instrument refinished by Tom Murphy, the man behind the Gibson Historic series and probably the most renowned “goldtop guy” in the world. 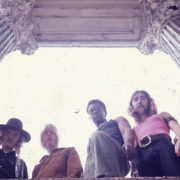 The guitar was restored to its original glory and placed on display at the Allman Brothers Band Museum at the Big House. Opened last year in the communal house where various members of the band lived, played and jammed together from 1970 to 1973, the Big House Museum includes thousands of artifacts from the ABB’s career. 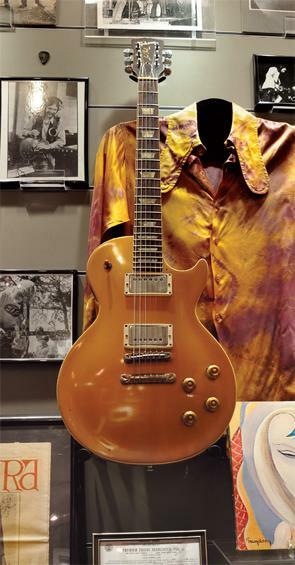 The goldtop is displayed along with artifacts directly related to it, including a shirt given to Duane by Clapton during the Layla sessions and two amps Duane used with the guitar: a Fender Showman and a 50-watt Marshall head, which were sometimes used together. Other items on display at the museum include Berry Oakley’s Fender Jazz “Tractor” bass and Showman amp, a T-shirt from the first-ever run of ABB merchandise, a Fender Bassman that Dickey Betts used during the band’s earliest days and one of Duane’s Marshall cabs. It also includes a recreation of the famous Fillmore East stage, where the band recorded its landmark At Fillmore East live album in 1970. The display includes a set of vintage Ludwig drums used by Butch Trucks from 1968 to 1970, and a pair of road cases with stenciled lettering pictured on the cover of At Fillmore East. Selfie with goldtop and EJ. I had a chance to see this guitar and hold it in my hands, the guy was asking $1,000,000 for it. It was at a collector’s show in Gainesville about 9 years ago. I checked the serial number, It was the real thing. Thanks… Wow… Wnder what it would be valued at now… I think it’s great that the owner has allowed it to be played so much. That guitar will easily bring $1,000,000. Greg Martin of the Kentucky Headhunters has a ’57 that’s worth that much, also. the abb were the house band for a summer while one member attended uc my brother in law ran the ludlow garage for jim tarbel i used to help clean up the place, i still have a note duane wrote asking the store owner down the street to sell me a pack of cigs for him (you could do that back then lol) used to watch the practice during the day for the show at nite / met so many great bands from that era ten years after,grand funk,rare earth those were the days!